Bullying is a challenging part of childhood. As a parent, it's not always easy to tell if your child is bullying others or being bullied. It can take some clever conversations to get your child to open up to you. When they do, you can give them guidance to help make school a safe place for everyone. Ask your child specific, relationship-focused questions to determine what's going on at school. While you may want to start out with "How was your day? ", you should progress to "What did you do at recess?" or "How did you spend your lunch?" These questions get at the heart of what your child's day-to-day experience is like. It's important to be supportive and caring during these conversations, since your child may be sensitive if they are in fact being socially excluded or are the target of bad behavior. Try talking about your own experiences when people have been unkind to you and how it made you feel. Be on the lookout for signs your child is having difficulty. 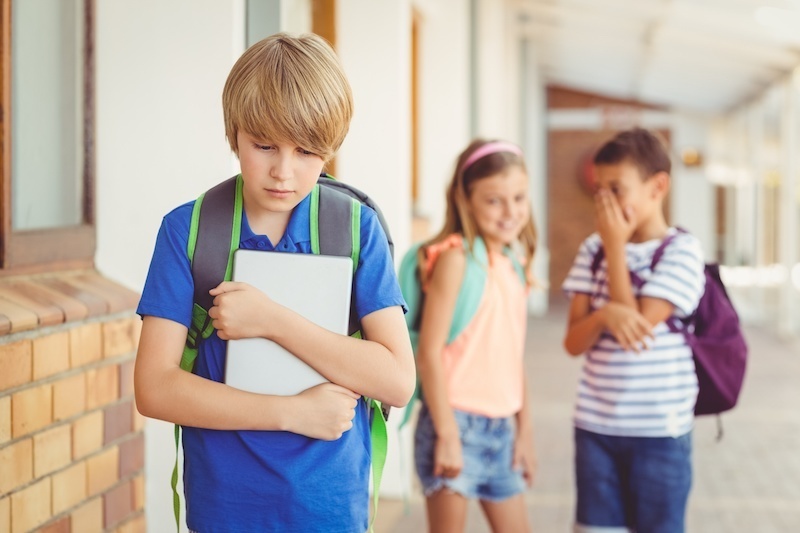 A child who is being bullied may seem anxious, have problems sleeping, have lower grades or avoid once-enjoyable activities. Your child should know to report the bullying to an adult, such as a teacher or parent. You can discuss the matter with the school administration so they can take steps to prevent situations that put your child and others in harm's way. Coach your child to walk away, say things like, "stop bothering me," or "yeah, whatever." Engaging in an argument can only make the situation worse by increasing aggression. Simple techniques like looking at the color of the other child's eyes can teach your child to look up at the bully to invoke confidence before stepping away. It's not easy knowing your child may be the source of bullying behavior. If you've noticed she is impulsive, gets angry easily, fights with siblings or pushes other children, step in with some calming techniques. Tell your child to take a few deep breaths when she feels angry. It's important to teach respect and kindness to others and to model that behavior. Everyone deserves respect regardless of how they look or what differences they may possess. Praise your child when she treats someone well. Consider speaking with a professional for more help if the behavior continues. Parenting is a long haul, and bullying is an issue that affects kids of all ages. Try to be patient, love your child and do your best to be supportive as they navigate growing up.